1. What is an Athletic Trainer? You may have seen an athletic trainer at a sporting event without even realizing it. No we don’t just tape and hand out ice to athletes. So what exactly is an athletic trainer? We are health care professionals that collaborate with physicians, physical therapists and other health care professionals. We provide services to active people such as but not limited to; prevention, emergency care, clinical diagnosis, therapeutic intervention, rehabilitation of injuries and medical conditions, and concussion management. 2. 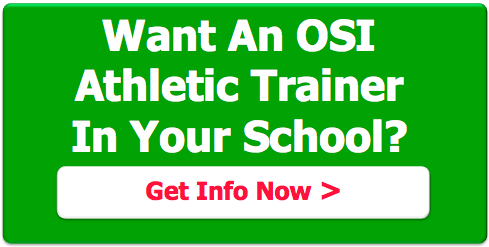 How do you become an athletic trainer? To become an athletic trainer you must either receive a bachelors degree in athletic training from an accredited college, or you can receive a masters degree in athletic training. Just getting the degree does not make you an athletic trainer. Once your schooling is finished you have to sit for a board of certification test. After passing the certification test, you can become registered or licensed in the state you wish to practice. The practice of athletic training regulated by the Board of Medical Practice in the state we live, and the National Athletic Trainers Association. 3. Where can an athletic trainers work? Athletic trainers can work in a number of job settings. Here is a list of places athletic trainers have worked: youth tournaments, High schools, colleges, universities, professional sport teams, hospitals, physical therapy clinics, physician offices, corporate and industrial institutions, the military and performing art locations.